Is your elderly loved one experiencing more bruising than normal? Noticing new bruises on your loved one’s arms or other body parts can be a startling sight. If you can narrow down what’s causing the bruising, you can sometimes get it under control. The first thing that you can do for a loved one who is experiencing more bruising than normal is to observe what is going on during a normal day. They may have balance issues they’re not comfortable describing to you or there may be a specific activity that is causing bruising. By examining a normal day for your loved one, you have some data that you can bring with you to your loved one’s doctor. Once you have done some observation, it’s time to take your loved one to his doctor. There can be a whole host of reasons why your loved one is bruising easily, so your loved one’s doctor may need to run tests to rule out specific problems. If your loved one’s doctor does determine a medical cause, that can give you a jumping off point so that you can try to get the situation under better control. Side effects from medications can also lead to bruising. There may also be medications that your loved one takes that cause problems with their ability to maintain balance, which can lead to an increase in falls. Some medications may not impact your loved one’s balance on their own, but combined with other medications, they may have this effect. If your loved one is having increasing issues with balance or with falling, make sure their home is as safe as possible. Handrails can make a huge difference in small rooms, hallways, and even in larger areas. Remove any tripping hazards such as cords or loose rugs. Thick carpet with sufficient padding can also help if your loved one is falling often. 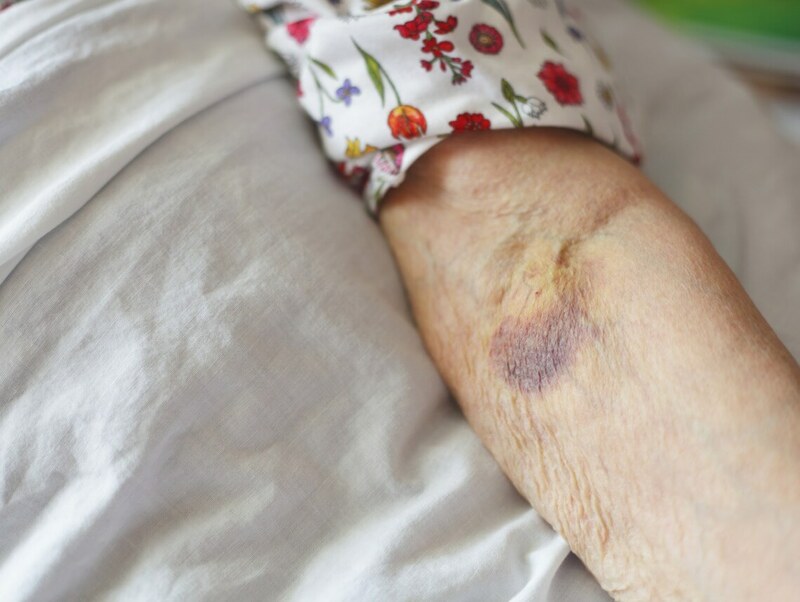 Let your loved one’s home health care providers and other family members know what’s causing his bruising so that they can help him to limit his bruising.